It's getting to be that time of year already - time to clean out the pantry. It looks as if spring is going to let loose on this corner of the world even more quickly than last year. Soon, I will be able to harvest fresh greens, and the roll into the growing season will have begun. Now is the time to eat the last of the frozen, pickled, and dried goods that are still lining the shelves. I'm a good little preserver, so there is plenty of food still to be eaten. I've got an especially plentiful supply of dried nettles. I happened upon a great new nettle patch last year, and was able to eat my fill of fresh, as well as stick a lot of them into the freezer and dried goods shelves. Now I've still got an enormous two gallon tin full of dried nettle leaves, more then I could ever drink as a simple tea, or crumbling into my soups and stews. I need to make a serious effort at eating these nettles (oh, the horror!). In the past, I've made a few batches of pasta with fresh nettles every year in the spring. But with some experimentation, I've found that nettle pasta is even easier to whip out with dried nettles, because I don't need to blanch, wring out, and pulverize the fresh plant. Instead, I can buzz up the dried leaves in my spice grinder, and incorporate them with the flour. I don't usually do this, but I've included separate recipes for both wheaty and gluten-free dried nettle pasta, since they are such wildly different beasts. The wheatiful version turns out a thin, bouncy noodle that will remind you of spinach pasta. The gluten-free noodles are a little thicker and more rustic, but they remind me of homey egg noodles my Gran used to make for her chicken soup. Both recipes require that you fuss a bit with the amount of water added to achieve the desired texture. This varies greatly based upon the general humidity where you live. Don't be intimidated, though, the process isn't hard, and you'll be rewarded with deep green nettle noodles! Nettle pasta stands up well to all manner of sauces, and is a great last-minute addition to soups. You can also use nettle pasta for making fantastic lasagna and ravioli. My favorite way to serve nettle noodles is tossed simply with a pat of porcini or wild allium butter. 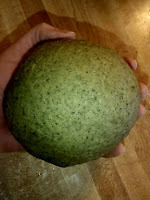 All of the photographs in this post are of the gluten-free version of dried nettle pasta. 1. 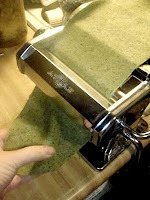 Dump the flour and nettle powder onto a clean countertop, and use your hands to thoroughly mix the two together. Gather the mixed flour and nettle into a pile, then hollow out a well in the center. 2. 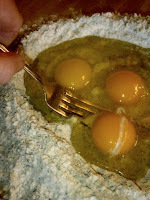 Gently add the eggs, olive oil, salt, and first tablespoon of water into the well. 3. With a fork, gently mix the wet ingredients. When they are somewhat evenly combined, start pulling small amount of flour from the inside edge of the well, and incorporate it. Bring more and more flour into the well and mix it with a fork until it is no longer possible to mix with a fork. 4. At that point, start combining and kneading the dough with your hands. It will be a huge mess at first, but the dough will eventually start to pull together into a ball. 5. Knead the dough for a good 5-10 minutes. If it seems raggedy and somewhat dry, add water a tablespoon at a time, and knead it in. The dough is the right texture if it is smoothly rubbery, like a piece of gum you've chewed for an hour. 6. Gather the dough into a ball, wrap it in plastic wrap, and let it rest on the counter for two hours. 7. Using a pasta machine, roll the dough out thinly, and cut into your desired noodle shape. 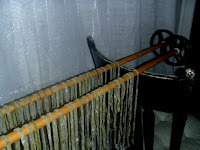 It helps to cut the ball of dough into four pieces, and run them through the machine in batches. Alternately, roll the nettle pasta dough out as thinly as possibly with a rolling pin, lightly dust both sides with flour, roll it up into a log, then cut the log every 1/8" or so to create long noodles. 8. Use the noodles immediately, cooking to al dente in salted boiling water. 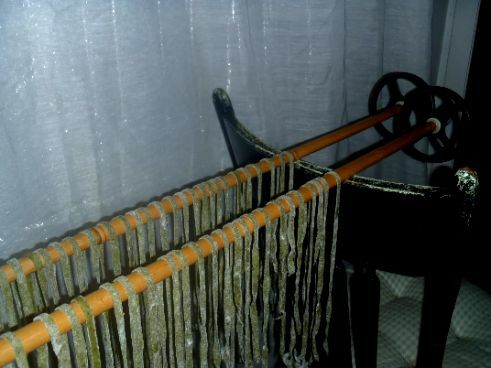 Or dry the noodles over a dowel or long rod (I use ski poles propped between two chairs) until they snap, then store in an airtight container. Follow the directions for the wheat-based noodles. The gluten-free nettle pasta will never get as smooth as the wheaty version, and may not roll out to be as thin without cracking. It should, however, come together to make a nice even dough. The key is feeling out the correct amount of water to add. The gluten-free noodles benefit from the same rest time, obviously not to let the gluten relax as with the wheatiful version, but to give the various flours and nettle time to fully absorb the moisture. I've found this really helps make the dough a more desirable texture, and much easier to roll out. 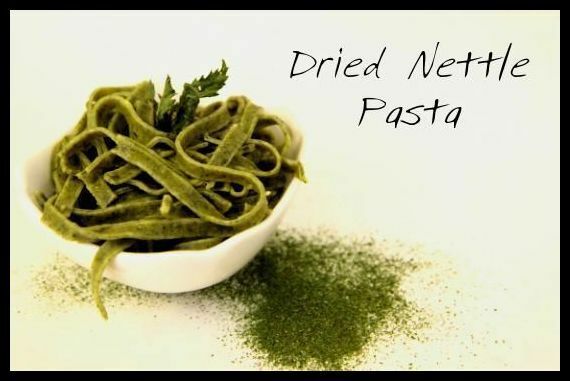 Looking for more nettle pasta goodness? Have a look at Hunter Angler Gardener Cook's recipe for Strettine, or this recipe for Pasta Verde all'Ortica from Emiko Davies. I think I made like 100 batches of pasta the last few months (or it felt like it). The sweet rice flour and starch give it some smoothness, the buckwheat, xanthan gum, and eggs give it strength. And a little oil makes it more supple. I think the picture with the pasta machine shows how nicely it rolls out. I hope it works for you. Do you think I can make this without the eggs? You can certainly try. I made several attempts at buckwheat/nettle and buckwheat/golden-flax/nettle, but they just didn't make a satisfying pasta. I've never been brave enough to try my hand at making nettle pasta, but this sure looks like fun. Thanks for including a gluten-free recipe. That takes balls, LOL. I was even able to pull it off without balls. Why haven't I ever thought to make it with dried nettles????? Arg! Honestly, it hadn't occurred to me until last fall, either. I see these things and they look so good, but then I chicken out. Any advice? Have you cooked with nettles before? Nettle pasta isn't hard to make, but if that seems like too much of a leap, you might prefer to start with something simple like quick sauteing nettles with garlic and olive oil. Every picture is of the gluten-free nettle pasta? Impressive. That gives me confidence. I haven't had the old pasta roller out in years. Woohoo! Thanks for this. I too have jars full of dried nettles that need to be used up before the new season's bounty arrives. I'm going to whip up some of these and pair it with a Black Trumpet sauce and maybe a little soft goat cheese. Nice work. You've really got to be careful with telling me about meals like that. You are running the risk of finding me on your doorstep! Just wanted to report that I tried the gluten-free version and it was exquisite, so smooth. I was actually sort of shocked (in a good way). I love a good pasta, miss it, miss the green quality of spinach noodles. These are even better. I've been wondering what to do with all of my extra dried nettles. Thanks for the great idea.